We recently wrote about the fascinating Secret of Ereikoussa, where the residents of a small Greek island risked their lives to save a Jewish tailor’s family from the Nazis during WWII. In November 2013, Emmy Award-winning writer, producer and author Yvette Manessis Corporon contacted MyHeritage to ask for help in finding the descendants of the Jewish tailor – Savvas from Corfu, Greece – who had been hidden on Ereikoussa during the war. She had written a book inspired by her grandmother’s memories of the island, and the story of Savvas was an important part. For Yvette, the story was incomplete and she wanted to discover what happened to the family after the war. MyHeritage accepted the challenge and embarked on a genealogical journey to uncover the mysteries of this long-kept secret. Starting with just five first names (Savvas, his three daughters Spera, Julia and Nina, and another child – Rosa) we were successful in locating descendants of the family in the U.S. and in Israel. Last month – at an official island ceremony – the families reunited to honor the island’s residents for their courageous efforts. The day before the ceremony, the families arrived in Corfu, to meet each other for the first time. It was an extremely emotional moment for everyone. With not a dry eye in the room, the families viewed photo albums together and shared memories. Later that day, the group toured the old Jewish quarter in Corfu where they visited the synagogue and a special monument dedicated to those who had perished in the Holocaust. As part of the itinerary, the group then went on to tour the local Jewish cemetery. But there was yet another emotional revelation awaiting the families. Until now no-one had been able to locate the grave of Savvas Israel. He passed away on the Island in 1944, and was buried outside the cemetery gate, but at some point his remains were removed and buried elsewhere. Just a few days before the visit, MyHeritage discovered that during a recent cleaning of the Corfu Jewish cemetery, Savvas Israel’s gravestone was found. The group stood by the grave and paid their respects to the man who’s connections with the island helped his family survive the war, and recited a memorial prayer. After the reunion, tour, and cemetery visit, the group went to eat dinner and swap stories. Even something as trivial as a meal out, was full of meaning. The last time these families had eaten together was over 70 years ago, and under very different circumstances. The festive Greek meal continued with music and dancing. The next day, the group headed to the island of Ereikoussa to see where the story began. They took a long bus ride through the Corfu countryside to the port, and then boarded a boat for the 40-minute ride to Ereikoussa. When they arrived at the island, a group of children and other islanders dressed in traditional costumes, welcomed them. 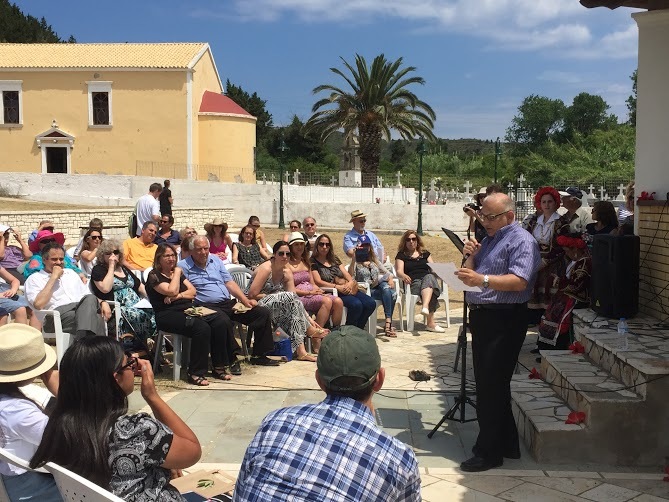 Some 150 people attended the official ceremony on the island, including the deputy mayor of Corfu and the mayor of Ereikoussa. Among the speakers were Danny Rainer (International Raoul Wallenberg Foundation) and Marcia Ikonomopolous (president, Association of Friends of Greek Jewry), who presented an award to the community for their heroic efforts during the war. Yvette spoke and expressed her happiness that the reunion was finally taking place, something she had hoped would happen ever since she first heard the name Savvas. MyHeritage Founder and CEO Gilad Japhet spoke about the challenges faced during his search for Savvas’ descendants, and elaborated on the importance of sharing these amazing rescue stories to avoid their being lost. 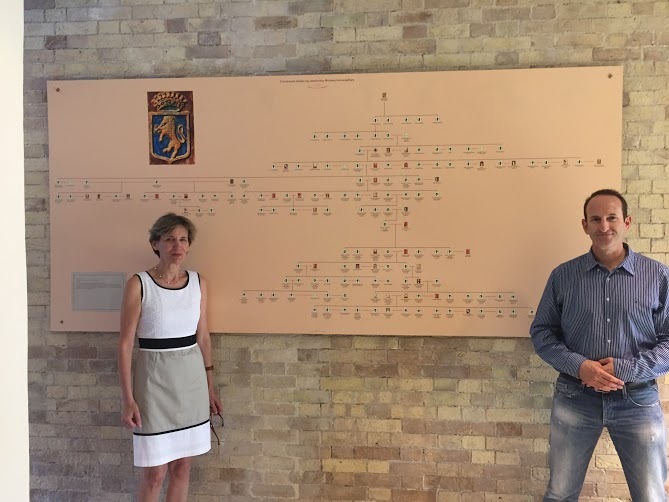 He showed the family tree built by MyHeritage’s researchers of Savvas and 147 family members. Gilad also addressed the relationship between Rosa and Savvas’ family which was also recently uncovered. The Hassid brothers always believed that Nina, Spera and Julia, the 3 daughters of Savvas, were their mother Rosa’s aunts. This is how she had identified them to her children and how they referred to them. In Greece, however, it was customary to refer to relatives as uncles and aunts even if the family was more distant. Through researching the family history, it became clear that they were related, but were not aunts. The MyHeritage team found a relationship through Rosa’s mother Sara Belleli (born Mizan). Based on birth certificates and other research, the connection was via Zacharias Osmo, the grandfather of Spera, Nina and Julia, and the great-grandfather of Rosa. Spera, Nina and Julia were first cousins of Sara Belleli, Rosa’s mother. After presenting the family tree, Maayan Hassid, Rosa’s granddaughter, gave a tearful address, filled with memories of her grandmother and the life she led after arriving in Israel. Other descendants – including Rosa’s sons Peretz and Avraham – thanked Yvette and MyHeritage for their work and enormous efforts in uncovering the island’s secret and discovering their family’s history. The ceremony concluded with a musical performance in Greek and Hebrew by opera singer Lina Orfanos. After lunch, the group visited Yvette’s grandmother’s home and the priest’s home where Savvas’ family was hidden. The group was in for another surprise, when Yvette showed Savvas’ relatives the room where he worked, and his sewing machine. Following the exciting day on Ereikoussa, everyone boarded a boat and returned to Corfu. While in Corfu, MyHeritage CEO Gilad Japhet met with Nella Pantazi of the GSA-Archives of Corfu who had helped MyHeritage with providing sources on the Corfu Jewish community. We were happy to see that the archives had used MyHeritage to build the family tree of the founding fathers of Corfu. The tree is displayed in the main building of the Archives, and the MyHeritage logo appears at the bottom. Some seventy-one years after Savvas’ death, the journey which began with only a handful of names, has led to a growing family tree, and the forgotten history of Corfu’s Jewish community being brought to life. We are happy to have been able to help Yvette find the descendants, to help them learn about their amazing history, and to participate in this special reunion. That is amazing. It’s a heart warming story and should be shar d. Thank you. It’s wonderful. We need more stories like this. Thank you so much for sharing this story. Yes, these stories of the survival of the Jewish people need to be preserved. Beautiful story. Kindness to one family leaves a legacy. Wonderful story, amazing what can be found in tracing our root. Awesome! Loved this story. Would like to see many more like this one. Nothing short of a miracle! What an incredible story! Points out that one should never give up when researching ancestors. Awesome, amazing, heart warming story 🙂 awesome work from the ‘My Heritage team. What a wonderful story – and a response to whoever questions why bother with family trees, and who is interested….I am!! MyHeritage is doing wonderful work. Thank you. Lovely warm story how some people can risk their lives to help and save lives others can take lives in the name of their cause. Europe waiting to be written. Wonderful research and history! Am so pleased for these families. MyHeritage really stepped up and did an outstanding job. A wonderful story and a very happy end. It gives you a warm feeling hearing/reading about what people would do to help others in times of such awful predicaments. Awesome! Great story and great service you have done for those families! I can imagine the emotions this family is feeling! Congratulations to MyHeritage for helping them! Thank you, Thank you,, Thank you, what a beautiful story..
Beautiful story – wonderful example of collaboration. Thank you! What a beautiful and fascinating story! This is a wonderful story that is only made possible by common man’s love and courage. Thank you Myheritage for helping to bring this story back to life. So moving. Brought me to tears. I liked the story as it end with reunion. Lovely story; I was nearly moved to tears! How I wish I too could trace my family’s roots but I doubt they could as they cover two countries,Spain – and the Philippines,where records were either “destroyed” during the war or “made invisible” by interested parties unless money was exchanged! (And even then one could not be sure he/she was just being led around to extract money!) But what should make our family tree very interesting is that my departed father,unless not telling the truth (lying?) told us once that he was related from the “conqueror” of the Philippines (years after Magellan was killed there),Miguel Lopez de Legazpi (which is why my father migrated to the Philippines in the 1920’s). Wow! Reading this brought such perspective to my day – family is what truly matters. Thank you for sharing this heartwarming story. My grandfather, Enrico Giuli Besso was born in Corfu. At the beginning of the 1900s he moved to Trieste, Italy along with other family members, where there was a large Jewish quarter. One day I hope to go to Corfu just to see where he lived and expand my research of my family tree. He died before WW2, some family members survived, some were deported and did not survive. To the many unknowns heroes who saved so many lives, I thank you and respect you because without them I probably would not be here today. Thank you for this wonderful story and telling us about this reunion. It actually moved me to tears that you could uncover such a secret after all these years and trace the family. WELL DONE FOR YOUR EFFORTS. i’m sure it will be a blockbuster !!! What a touching story, especially as now many Greek people despite their hard times are helping Mediterranean boat people. What generosity from the Greeks. It reminds us that there are always also good people everywhere. Lovely moving story and confirms that history is so important to us all as human beings. I and my sister have been reseaching our paternal family for years and only recently found another brother from a first marriage we never knew about. Fortunately we are in contact with the only surviving brother of that marriage in Canada. Fantastic story. Heart ♥ felt. Mr Savvas passing touched my heart, only 44 years old. They are so fortunate to have Myhertiage Foundation, their resources and such wonderful people to help them, I know it meant so much to have many of their unanswered questions completed. I would love to know my roots. My Great Grandfather, because of sickness, was at the age of 3, left behind in Oran, Missouri, with only his name. I have tried to trace with any success our family. A wonderful story, Thank You for sharing. What a beautiful and heart warming story! Such a beautiful story and after all that time a happy ending. Good on you My Heritage for all your research. A search of 5 names resulting in a very large gathering of 5 generations all because of kindness by Greek people not afraid of consequences if found. Congratulations My Heritage for the amazing help you are online. I am also tracing my relatives on my father side.On the paternal side it involves 2 countries China and the Philippines.My great grandfather belongs to the Yap families who migrated in Guagua,Pampanga.He had children who moved in Pikit and Pangalungan,Cotabato,Philippines.One of his sons is my grandfather who brought 2 of my uncles in China sometime in Dec 17 or 19,1932 in China.They were not able to return in the Philippines.I wish someone like My Heritage could help us find them if still alive or their families.Thank you and Congratulations to my Heritage. An amazing story and a very heart warming one! It once again points out that we are in the Christian sense all ‘Brothers and Sisters’, and if the peoples of the world , AND THE POLTCIANS would only take this attitude to heart, WE all would be living in a much safety and therefore happier world !!. A really moving and very important story about a brave island community that saved the lives of Jews. I HAVE NOT READ THE ORIGINAL BOOK BUT IT SOUNDS FASCINATING. a COUSIN HAS TRACED MY MATERNAL FAMILY TREE BACK TO WHEN THEY ESCAPED TO ENGLAND FROM FRANCE WHEN ALL THE TROUBLES WITH THE HUGENOTS WERE HAPPENING. THEIR SURNAME WAS CHANGED COMPLETELY FROM .CAHAIGNES, OVER 50 TIMES UNTIL WE ENDED UP AS, KEYNES, IN OR AROUND 1300. MY COUSIN TRAVELLED TO ENGLAND TO DO A LOT OF THE RESEARCH.